Mysterious men have a way of showing up in Stephanie Plum's apartment. When the shadowy Diesel appears, he has a task for Stephanie--and he's not taking no for an answer. Annie Hart is a 'relationship expert' who is wanted for armed robbery and assault with a deadly weapon. Stephanie needs to find her, fast. Diesel knows where she is. So they make a deal: He'll help her get Annie if Stephanie plays matchmaker to several of Annie's most difficult clients. But someone wants to find Annie even more than Diesel and Stephanie. Someone with a nasty temper. And someone with 'unmentionable' skills. Does Diesel know more than he's saying about Annie Hart? Does Diesel have secrets he's keeping from Stephanie and the two men in her life--Ranger and Morelli? With Stephanie Plum in over her head, things are sure to get a little dicey and a little explosive, Jersey style! Janet Evanovich's Stephanie Plum series is one of my guilty pleasures. 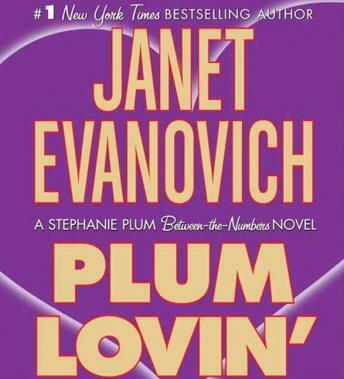 "Plum Lovin'" is my first experience with an Evanovich audio book. The reader, Lorelai something-or-other, had a really great range of voices and actually sounded alot like how I have imagined several of the characters to sound. I enjoyed this as much as the book -- maybe more. If you are an Evanovich fan, I hope you will be as pleased as me. I'm signing up for her other books thanks to this one. Not as funny as some of her other books, but I love the narrator (Lorelei King). Evanovich's stories are predictable, but Lorelie gives them such an amazing reading that they are great fun to listen to. This is a short story for Valentine's Day. Evanovich is a master of dialog and this story moves fast via that method. This is a great book for a short commute that will leave you with a smile at the end of the trip. I love Stephanie, Joe, Lulu and the gang. I read everything that Janet Evanovich writes. Her stories are entertaining and filled with humor, suspense and romance - 3 great features for any book. I think I like the non-bounty hunter Stephanie just fine. She's a good cupid. Nice change of pace. Fun fast paced book, a great addition to the Stephanie Plum collection. It was refreshing to listen/read that didn’t include “Ranger or Murielle” Not the best of the collection but still worth renting or buying.